CLICK HERE to watch a webcast from Bracken Bat Cave, the world’s largest bat colony, located near San Antonio, Texas, which is the summer home of the world's largest bat colony. With millions of Mexican free-tailed bats living in the cave from March through October, Bracken holds one of the largest concentrations of mammals on earth. The emergence of these millions of bats, as they spiral out of the cave at dusk for their nightly insect hunt, is an unforgettable sight. Learn about: the Mexican free-tailed bats of Bracken Cave and other bat species, predators that wait for their nightly emergence, threats to bats including White-nose Syndrome, how you can help these beneficial creatures, how bats navigate using echolocation, cave ecology and more. CLICK HERE to watch the program, BatsLIVE: Bat Basics. Rob Mies with the Organization for Bat Conservation brought his bats to show and discuss. Rob and his bats have appeared on the Tonight Show, Ellen Degeneres Show, Today Show, Live with Regis and Kelly, Late Night with Conan O’Brien, and Martha Stewart. 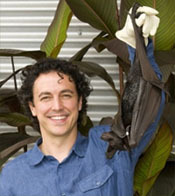 Rob co-authored the book, “Stokes Beginners Guide to Bats.” His research includes work with the endangered Indiana Bat of the United States, endangered Rodrigues Fruit Bat in the Indian Ocean, and the threatened Spectacled Flying Fox Bat in Australia. Ann Froschauer, National White-Nose Syndrome Communications Leader for the U.S. Fish and Wildlife Service, talked about threats to bats and how we can all help these beneficial creatures. Lea' is a wildlife biologist and has been working on bat conservation issues for more than 17 years. She works for the US Geological Survey in the Invasive Species branch of the Fort Collins Science Center in Colorado. Her work takes her to locations such as the western Pacific to assist in studies of predator/prey relationships and other research. On Guam Island and in the Northern Mariana Islands, one animal of interest is the threatened Mariana Fruit Bat, or fanihi, as spoken in the islands' Chamorro language. Lea' is also involved in several bat-related conservation organizations, working groups, and committees. Prior to working for the US Geological Survey, Lea' worked for over 10 years on bats and habitat preservation with the Colorado Division of Parks and Wildlife. Kirk Navo is a wildlife conservation biologist for Colorado Parks and Wildlife. He received his B.S. in biology from Central College in Pella, Iowa and his MS in biology from Fort Hays State University in Kansas. Navo was the project leader for the CPW’s Bats/Inactive Mines Project for 20 years, conducting surveys and evaluations of abandoned mines for bats statewide. 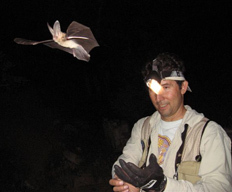 He has conducted surveys for bats statewide, using harp traps, mist netting and acoustic monitoring, and has been active in bat conservation efforts for 27 years in Colorado. Dan Neubaum is a wildlife conservation biologist for Colorado Parks and Wildlife. He earned his B.S. and M.S. in wildlife biology from Colorado State University in Fort Collins, Colorado and has been working with wildlife for 17 years. 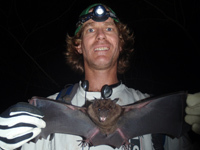 Dan has worked with bats in New Mexico, Arizona, Oregon, and Colorado on projects ranging from roost selection to rabies transmission. 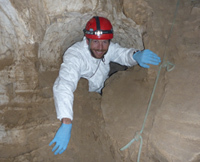 He currently assists with surveys for bats throughout Colorado with a focus on collecting baseline data for White-nose Syndrome monitoring efforts in caves and mines. Brad completed his B.S. degree in Wildlife Management at Humboldt State University, Arcata, CA in 1980. He has worked for the U. S. Forest Service for 25 years, 18 years as a wildlife biologist, and has been a district biologist on the Black Hills National Forest for the past 16 years. He serves as a contact person for issues related to bats and bat management in the Rocky Mountain Region (R2)-Forest Service. He also is Chairperson for the South Dakota Bat Working Group. Apple Snider is a wildlife biologist with the USDA Forest Service in Steamboat Springs, Colorado. 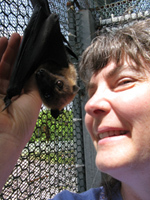 She holds a bachelor's degr ee in environmental studies from Middlebury College, a master's degree in ecology from Colorado State University, and has worked with bats and other wildlife for over 15 years. Apple's passion for bat ecology and conservation has led her to work as an animal care and education specialist for the Organization for Bat Conservation in Michigan and on bat-related field research projects in Colorado, New Mexico, New York, and Panama.